Photo courtesy of River Rowing Assoc. River Rowing, a relatively new community program in Nyack, NY, has been plying their small stretch of the Hudson River since 2003. Their water is tucked in the lee of the western shore on a section of the Hudson so vast that the area's original Dutch settlers called it a sea: the Tappan Zee, to be exact. That is also the name of the now-aging bridge that spans the Hudson just south of River Rowing's Nyack docks. The club's rowers--masters, juniors, and collegians alike--row under the bridge almost every day, and in recent years, have had to deal with the increasing river traffic of the construction crews working to maintain the roadway on the bridge's long western span--not to mention the occasional pieces of the bridge that fall into the water. That construction activity is about to expand massively, as the federal government looks to jumpstart the five billion dollar effort to replace the 56 year-old structure. The work will almost certainly shut down much of the western shoreline which River Rowing calls home for four years, or more, while the finished replacement bridge could limit water access altogether in the town. Yet, what started as a potential loss of the good rowing water tucked under the aging Tappan Zee Bridge has turned into a novel, if not radical proposal to save waterfront space, add river access, and turn the Tappan Zee basin into a growing rowing community--complete with a boathouse that River Rowing can call home. River Rowing has undertaken a seemingly hopeless task: injecting their small group and very specific concerns into the mammoth project by talking with the state and federal authorities about making continued and even improved water access a part of the project's next planning phase--and the club's pitch takes things a step further, envisioning permanent boathouse facilities built right into the footprint of the bridge project. River Rowing's petition calls for "the inclusion of boathouses at either termini of the replacement Tappan Zee Bridge" as "a meaningful improvement to the project" and club members have been taking this idea to both Washington DC and the state capital in Albany as the project begins to move forward. Plans for the replacement bridge already contain "transportation enhancements" designed to trigger better matching funds from the federal government, but these are--for the moment--limited to a bike and walking path on the bridge itself. 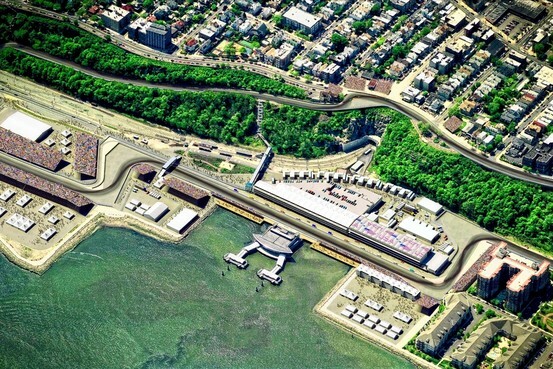 River Rowing's idea would extend that kind of "public use" consideration to the area below the bridge, where continued waterfront access could otherwise develop into a real concern for Nyack residents, and the rowing community. Ultimately, says River Rowing's Joe Devoe, "We think [it] will improve Nyack as a destination, if river access is available underneath the bridge." Devoe has been spearheading the club's efforts with the government, and dared to dream that project could eventually create permanent spaces for rowing and other waterfront activities. Devoe's initial inquiries grew out of a concern for what impact the actual construction period might have on rowing. "We asked them to consider the construction impact," says Devoe. "It's going to be four years of difficult navigation for us, at the very least, if not [an] outright inability to access that part of the river." The idea of improved water access and potentially permanent boathouse sites sprang out of the idea that the rowing in the area could be disrupted for such an extended period. Making boathouses and post-build access part of the project, says Devoe, "is a mitigant to the impact on the local communities and the folks that live in the area." Adding public use amenities in terms of water access to the finished project "will allow the local community improved access to the water," says Devoe, long after the replacement bridge is completed. Peter Klose, the secretary of River Rowing, says that this kind of consideration in the planning of the new bridge would be "a good way to give back to the community, and build a relationship between south of the bridge and north of the bridge." Klose sees "community boathouses" as having the potential to play a major role. "From an economic development point of view," says Klose, "[the town of] Nyack can rebuild itself into a waterfront community, with access to the waterfront, and that's what [this proposal] is all about." While the idea of adding boathouses to a major transportation project may seem novel, the idea behind the proposal is simple, according to Devoe: "We just thought that if you could improve the Tappan Zee Bridge area with some public water access waterfront access that would be great for a lot of people. We've been able to serve hundreds of people [just] rowing out of a parking lot." 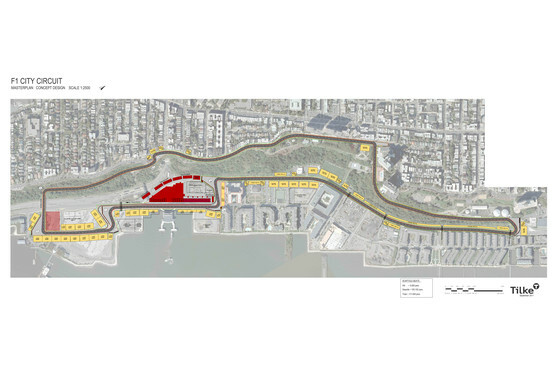 This proposal would create "a permanent location, somewhere where boats can be protected and where people can access the water," he says, "so we're hoping that somehow that can be worked into the plans for the bridge." With a publicly quoted price tag of five billion dollars, the Tappan Zee Bridge project is massive, and highly politicized. Yet, as River Rowing petition points out, even a multi-million dollar boathouse for the local community would represent less than 0.2% of the staggering budget for the new bridge. "We're probably two strokes in to a full 2k race right now," says Devoe about the long process ahead. "We just hope to have this project improved by incorporating public access to the Hudson, it's really an amazing body of water and the jewel of our riverfront communities." River Rowing's first task is getting their concerns--and the very principle of waterfront access--included in the environmental analysis of the project. Their petition, which was due on Tuesday, November 15th--you can view it here--states that "this boathouse proposal could meaningfully mitigate construction effects by providing increased access to the Hudson following the long construction and demolition period associated with the replacement Tappan Zee Bridge. Such boathouses could serve as gateways for recreational use of the majestic Hudson River. These boathouses would add significant recreational resources to the area by providing a base from which to operate rowing, kayak and canoe programs and by improving launching access." For now, River Rowing's vision for their part in this project is just a hope that their voice, and the way they see and use the Tappan Zee's water, can become a part of the conversations as things move forward. 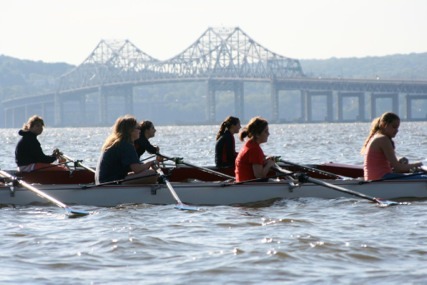 For millions, the Tappan Zee Bridge--new or old--is just way over the river, but for these rowers, the new bridge represents a chance to give greater access back to communities most impacted by the bridge, and maybe a boathouse to call their own. The recovery of the bald eagle in New York State has made it possible to see eagles year-round, especially near nesting sites. 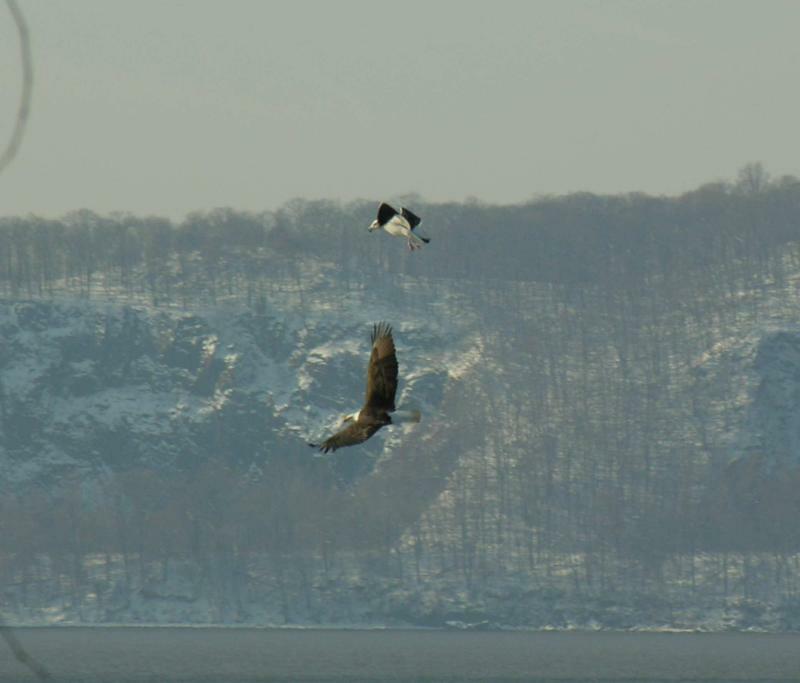 The best viewing opportunities, however, come in the winter months when scores, and sometimes hundreds, of birds arrive from deep-frozen territories to the north and east of the lower Hudson Valley, where they can be seen fishing and interacting in many ways. The following programs take you to easily reached viewing areas where the presence of people is not alarming to the birds. Last year, our programs were geared for the "early birds" among us and began around the time of sunrise, when hungry birds are coming off the night roosts and taking up daytime positions. A winter sunrise, the comfort of your warm vehicle for a "blind" and a tree or ice floe full of bald eagles... well worth rolling out of bed a little early! Croton Point Park directions: From Routes 9/9A, turn west onto Croton Point Ave (from south, make a left; from north, make a right). After about 100 yards, you will see the Railroad Station and parking lot on the left. Turn left as if you are going to the station. Go about 1/2 mile past station to the end of the road and look for the group in the parking lot. Georges Island Park, Westchester County directions: The entrance to the lower parking lot of Georges Island Park in Montrose is off the Old Post Road (Route 9A), just to the north of the FDR Veterans Hospital. Turn at the County Park sign and proceed 1 mile to the park and waterfront. HRF Bald Eagle Viewing Programs are free and open the public. No reservations are required. If there are questions about the weather, please call 914-739-3222 right before the Bald Eagle Viewing.